Morgan Whitbread is not just a pretty face. She’s pretty busy, pretty strategic, and pretty well-rounded. This Red Deer local is a 20 year old in the Media Studies and Professional Communication program at Red Deer College. As with several young women, her points of self definition come from her hustle. Yoga teaching, promo coordinating, and being social online make her who she is. Positioned as an up-and-coming social media influencer with ties to the Rebels, Jo(e) Social Media, and The Breathing Room, Morgan has a style that echoes her environment. Red Deer is casual and comfortable, and this is Morgan’s self-description. A true Alberta girl, she is obsessed with coats (those come in handy here) and style that makes her feel good. 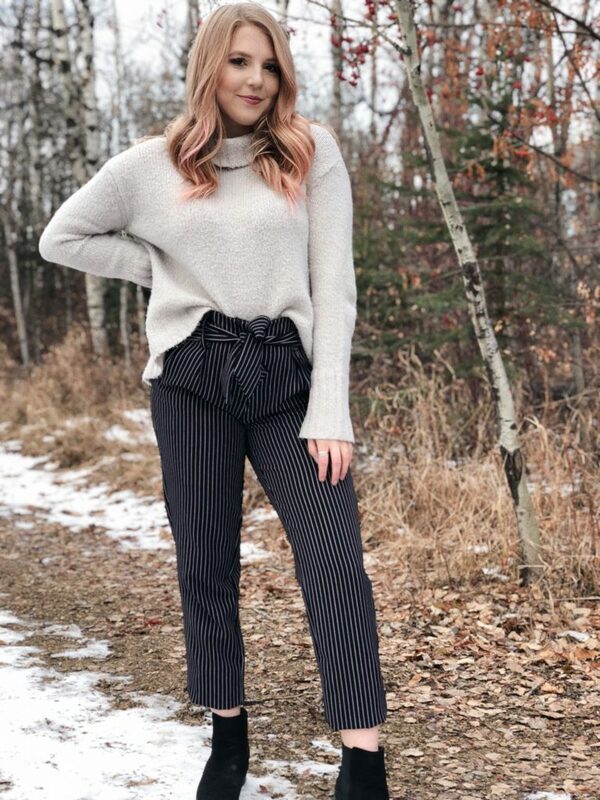 Fashion is this young woman’s platform to inspire confidence and spread her motto, “just be yourself and do what makes you happy.” When it comes to social media, Morgan strategically uses her influence to inspire other young women and the next generation. Fashion is a means to more confidence and prompts creative collaboration. Morgan even strengthens the relationship with her sister using fashion, who doubles as her photographer. Morgan’s look (bottom left) is professional and poised. A great choice for the office or a meeting, this outfit is simple, and requires little “extras” because of the high neck and detailed pants. Cropped pants give a little extra va-voom to fabulous footwear, drawing the eyes down. This versatile dress (center) paired with long sleeves makes a more polished look for the office or fall evening. It could also be worn casually with no sleeves. Morgan has chosen strappy shoes with a pattern to offset her basic grey top. 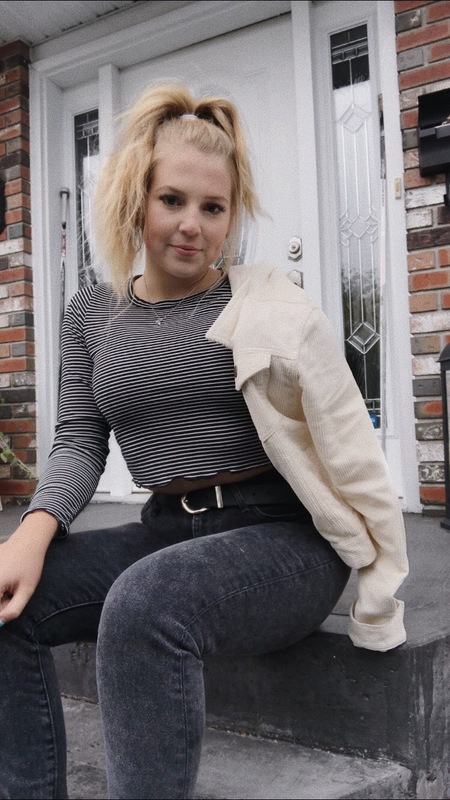 She works her own signature style of faded jeans with no rips, (bottom right) and, of course, a casual jacket from her collection. This ensemble emphasizes her comfortable and casual style all day. Morgan keeps feeling good and looking good synonymous. Sabrina is a free spirit. She likes to decorate her home almost as much as she likes to decorate her passport with stamps.